Set in a 19-acre woodland estate, overlooking the Exe Estuary, the family-run, mid 3-star Langstone Cliff Hotel, Dawlish Warren, commands stunning sea views, looking out across the blue flag beach and internationally recognised Dawlish Warren National Nature Reserve, a Site of Special Scientific Interest that is home to many unusual species of seabirds. Built around an 18th Century hunting lodge, leisure facilities at Langstone Cliff Hotel include heated indoor and outdoor pools, tennis, beauty and hairdressing salons, a snooker room and children’s play areas. In addition to the Lincoln restaurant and bar, there are plenty of sunlit public spaces, all fronted by a magnificent Victorian verandah with sea views across the hotel lawns towards the Exe Estuary and the English Channel. The popular beach resort of Dawlish Warren features a glut of pubs, bars, restaurants and shops. Plenty of events are organised throughout the year with free family entertainment in the summer. There is a public footpath leading from the hotel grounds down to the beach and the Nature Reserve. Warren Golf Club is also a short walk away – there is a golf practice area within the hotel grounds. Perfectly positioned on the South Devon coast, Langstone Cliff Hotel is 12 miles from Exeter and Torbay. 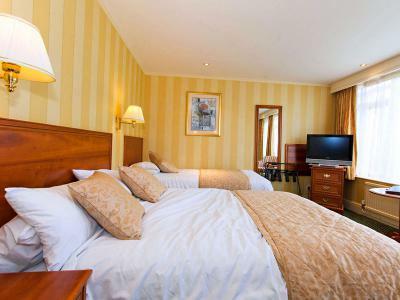 Langstone Cliff Hotel's 64 en suite bedrooms are set over two floors, with two rooms located in a comfortable annex just 10 metres from the main building. 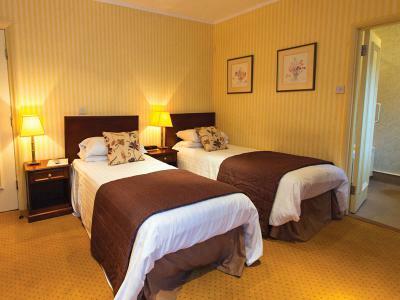 Rooms have free Wi-Fi, satellite TV, including Sky Sports, and 1,200 pocket-sprung beds by either Hypnos or Mattisons. Many rooms look over the hotel's wooded grounds or have stunning sea views. Seventeen bedrooms feature private balconies. Baby listening and room service is available. Contemporary style en suite bedroom, offering free Wi-Fi, tea and coffee making facilities, trouser press, desk, heating, shower, bath, TV, telephone, radio, satellite channels, flat-screen TV and alarm clock. Ground floor poolside. Contemporary style en suite bedroom offering free Wi-Fi, satellite TV, digital radio, fridge (on request), writing desk, direct dial telephone, ironing station, trouser press, tea and coffee making facilities, toiletries, hairdryer, and key card access. Contemporary style en suite bedroom offering free Wi-Fi, satellite TV, digital radio, fridge (on request), writing desk, direct dial telephone, ironing station, trouser press, tea and coffee making facilities, toiletries, hairdryer, and key card access. Contemporary style en suite family bedroom with balcony, offering free Wi-Fi, tea and coffee making facilities, trouser press, desk, heating, shower, bath, TV, telephone, radio, satellite channels, flat-screen TV and alarm clock. Exit the M5 at junction 30. Follow the signs for Dawlish (A379). Continue on the A379 for approximately 7 miles, through the villages of Kenton and Starcross. At Cockwood, take the Dawlish Warren Road for 1.5 miles. Proceed through Dawlish Warren, past the turning to the beach on the left. Continue up the hill, past the Mount Pleasant Inn on the left. The hotel entrance is 50 metres on the left. Wake up to a delicious full Devonshire breakfast in the Lincoln Restaurant or choose from an excellent selection of cereals, pastries, breads, and fresh and tinned fruits. A traditional-style Sunday lunch carvery is available daily. Dinner offers a table d'hôte menu with vegetarian and gluten-free options. There is a reasonably priced, expansive wine list featuring wines from most of the principal wine producing regions of the world. The eccentric Lincoln Bar with its boutique-style seating and quirky feature walls lies at the heart of the Langstone Cliff Hotel and is open 365 days a year. Opposite the hotel’s public rooms - all fronted by a magnificent Victorian cast iron colonial verandah with spectacular sea views – the bar has a choice of seven draught beers and ciders, wine by the glass, soft drinks, Twinings and Tetley teas, and Douwe Eggbert coffees. In the summer, dining at Langstone Cliff Hotel reveals an altogether different flavour. Take a seat in the fresh open air - sunny or shade - and dine al fresco. The public rooms - the lounge, verandah room, drawing room and the poolside room - are fronted by a magnificent Victorian cast iron colonial verandah, with spectacular sea views out towards the Exe Estuary and the English Channel, offering an oasis of calm to spend a long summer evening after exploring the local area. Don't miss the opportunity to indulge in afternoon tea whilst staying in this glorious setting - savour homemade scones with fruit preserve and cream, sandwiches, cakes and a pot of tea. Both traditional afternoon tea and champagne afternoon tea are available to order and can be enjoyed in pub restaurant or in the beer garden. Afternoon tea can be booked in advance, at a special price, when booking your room via ClassicBritishHotels.com. The unique surroundings of Langstone Cliff Hotel present a wonderful setting for private dinners and celebrations. The hotel caters for reunions, anniversaries, family gatherings, birthday parties, charity and club events, and business dinners. Choose from a range of private rooms, each with its own individual character. Call Classic British Hotels on 0844 967 0984 for advice and let us help you organise a memorable private dinner. Leisure facilities at Langstone Cliff Hotel include indoor (10 metre) and outdoor (12 metre) pools, a fitness room with four cardiovascular machines, and a hard tennis court next to the footpath leading down to the sea. There is also a snooker room with a full sized antique Burroughs and Watts table and a table tennis room. For children, junior indoor and outdoor pools, as well as indoor and outdoor play areas feature. A full range of spa treatments, using bespoke spa products, are available to book. There is a 200 yard practice area with bunkers and synthetic greens on the estate of Langstone Cliff Hotel. Just 700 metres away, however, Warren Golf Club, founded in 1892, provides a true links golf course on the South Devon coast. It has a dramatic setting, in a beautiful Devon Wildlife Trust nature reserve on a spit of land in the mouth of the Exe Estuary, and features fine greens and excellent clubhouse facilities. Surrounded by the natural beauty of the Warren, golf has never looked so good. One of the most important Stone Age cave sites in Europe, Kents Cavern was home to prehistoric humans for thousands of years. Inside the labyrinth of caverns are beautiful stalactite and stalagmite formations and an underground exhibition chamber. There is also a Stone Age woodland trail, an indoor kids archaeological dig area and hands-on cave art areas. The caves are a protected national monument and a major visitor centre for the UNESCO-endorsed English Riviera Global Geopark. On the banks of the River Exe, just outside Exeter, Powderham Castle dates back to 1391 and is one of England's oldest family homes. Damaged during the Civil War, the Castle was later restored and today visitors can marvel at the Georgian grand staircase, the 18th Century music room, or the Victorian kitchen. There are formal gardens (the rose garden is glorious in the summer), a potting shed, a play area and pets corner, Powderham Country Store, a foodhall, regular guided tours and a year-round calendar of events. England's first natural UNESCO World Heritage Site, this magnificent 95 mile stretch of coastline sweeps from East Devon to Dorset and showcases 185 million years of the Earth's history. Visitors are treated to a geological walk through time spanning the Triassic, Jurassic and Cretaceous periods. Text-book geological testaments to time include Lulworth Cove, Old Harry Rocks, the Golden Cap, Ladram Bay and Chesil Beach. Take the Jurassic Coast cruise from Exmouth for the best views of the stunning East Devon coastline. An ornithologist's paradise, Dawlish Warren National Nature Reserve is a Site of Special Scientific Interest (SSSI). Indeed, the Exe Estuary, including the National Nature Reserve, is a wetland of international importance under the RAMSAR Convention and a Special Protection Area under the EC Birds Directive for its wintering bird populations. Dawlish Warren is based on a spit of sand and gravel which is in a state of constant flux. Fragile habitats of sand dunes, ponds and estuary mud rich in organisms play host to migrating wading birds such as curlews. Behind the beach at Dawlish Warren, the 500 acre Nature Reserve is one of the most important wildlife sites in Devon. The Langstone Cliff Hotel nestles in 19 acres of woodland overlooking the sea at Dawlish, South Devon. The hotel is 5 miles from Teignmouth and Shaldon, a 20-minute drive from Exeter and Newton Abbot, and 25 minutes from Torquay. The M5 can be reached in 20 minutes, then Bristol is around an hour from there. Plymouth is also around an hour's drive away. When it comes to meetings and events, Langstone Cliff Hotel's easily accessible yet astonishingly beautiful location has international appeal. The Langstone Cliff Hotel regularly hosts events in its 400-seat Washington Ballroom, which has a long stage on one side, windows with sea views on the other, and a large, sprung, strip maple dance floor (154 square metres). There is a conservatory running the length of the seaward side which can be divided into 4 sections, an adjoining lounge bar, and a private foyer with cloakrooms and restrooms. Many of the meeting rooms have spectacular sea views. How's that for inspired thinking? Free Wi-Fi and free parking.